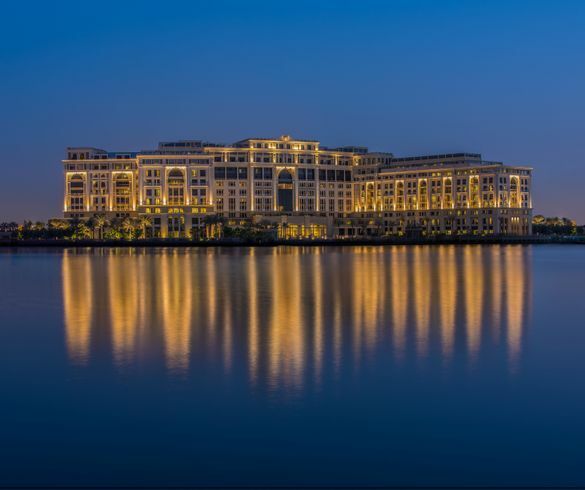 11 January 2019 – Romance reigns supreme this Valentine’s Day at the opulent Palazzo Versace Dubai, where some truly extravagant experiences will leave lovebirds starry-eyed. At Palazzo Versace Dubai, true romance is always in fashion and is the ideal destination for a glamorous getaway this February. This Valentine’s Day guests can immerse themselves in total relaxation with the hotel’s luxurious Romance offer. Couples can enjoy a three course candle-lit dinner under the stars, a special bath menu, ‘His’ and ‘Hers’ Versace bathrobes plus the one-of-a-kind rejuvenating The Chardonnay Grapes Luxury Ritual for Two; a unique couple’s treatment which uses grape seed extracts of Chardonnay, known for their powerful anti-ageing properties and begins with a reinvigorating body scrub and wrap, followed by a soothing massage using Champagne or sparkling grape juice to refresh and revive the skin and finished off with a chilled glass of Champagne (or mocktail) in their very own private Jacuzzi. Reminiscent of a 16th century Italian palace, Palazzo Versace Dubai features high ceilings and stylish rooms, with the signature Versace design elements evident throughout; exclusive Versace amenities; curated Michelin-level dining at the hotel’s eight contrasting restaurants and bars; beautifully landscaped gardens; and unobstructed views across the Dubai Creek. The hotel is conveniently located for discovering a little of the city’s heritage, including the atmospheric gold and spice souks, as well as visiting attractions such as the dancing fountains, Dubai Opera and Dubai Mall. For something extra special, Palazzo Dubai’s eminently knowledgeable concierge can arrange for some unforgettable experiences, from a magical hot air balloon ride to watch the sun rise over the city to a seaplane trip over Dubai Creek to see the iconic skyline from 1,500 feet; adventures into the desert to create everlasting memories for an authentic Arabian evening of cultural activities such as henna, music, dance, bread and Arabic coffee making before enjoying dinner under the stars; or sightseeing, Dubai-style in a classic chauffeur-driven Bentley. Destinology offer 3 nights at Palazzo Versace Dubai from £965 per person. Price based on two adults sharing on Half Board in a Deluxe Versace Room and return flights with Emirates. For further information or to book visit Destinology.co.uk or call 01204 474801.